Mish's Global Economic Trend Analysis: What's Behind The Soaring Savings Rate? What's Behind The Soaring Savings Rate? 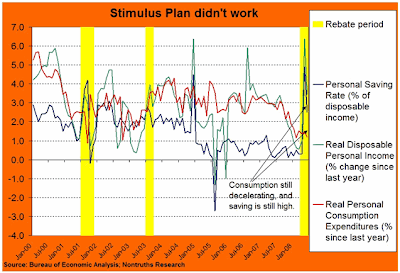 In Revisiting the M3 Contraction I stated "consumers are saving, rather than spending their stimulus checks". Some found that statement hard to believe. Let's take a look. Sev writes: "Mish, the argument that more people are saving is something I find hard to believe. Their bills are skyrocketing and "price" increases are eating into their monthly costs. Maybe some have paid down bills but I would bet the vast majority don't have the means. Now maybe ultra rich people are moving their vast sums into perceived safer investment vehicles but the thought that actual saving is increasing I don't think makes complete sense. I do buy that they are moving more money into checking accounts and are tapping their retirement early as well. As for seeing into what the dark pools of liquidity are doing I think that is the kernel." What Is The Savings Rate? Before we can state whether or not the savings rate is going up, we need to define it. The Federal Bank of San Francisco explains how the savings rate is calculated in a March 2002 article called What's Behind the Low U.S. Personal Saving Rate? How is the personal saving rate measured? The most frequently cited measure of the personal saving rate is based on the National Income and Product Accounts (NIPA). It is constructed by forming the ratio of Personal Saving to Disposable Personal Income (DPI), where DPI is defined as Personal Income (including wage and salary income, net proprietors' income, transfer payments less social insurance, income from interest and dividends, and net rental income) less tax and nontax payments to governments. Personal Saving is found by subtracting from DPI total Personal Outlays, 97% of which consists of Personal Consumption Expenditures (including consumer durables), with the remainder composed of Interest Paid by Persons (individuals, nonprofits, and trust funds) and Net Personal Transfer Payments to the Rest of the World. In simple terms (for most wage earners) the savings rate is after-tax salary minus personal consumption expenditures (PCE). The savings rate ignores interest income, capital gains, asset prices, etc. Inquiring minds may wish to take a look at the article for a good laugh, including this ridiculous statement "Current low personal saving rate would not represent a problem that is overhanging the U.S. economy, but is instead a manifestation of a more efficient deployment of the economy's resources." The author makes the same mistake many others have in attempting to justify the low savings rate based on asset price appreciation. The problem is easy to see in hindsight, consumers were willing to overleverage themselves in debt. Everything looked OK until home prices crashed. Now the debt side of the balance sheet dramatically outweighs the asset side of the balance sheet. Consumers, especially boomers heading into retirement have no choice but to reduce consumption expenditures and pay down debt. By definition that is saving. And indeed the savings rate is soaring. Let's take a look. The above Personal Savings Rate Chart courtesy of the BEA. Now that we have established (subject to government revision of course) that the savings rate is indeed going up, let's address why and how. Inquiring minds will wish to consider a WSJ article by Martin Feldstein The Tax Rebate Was a Flop. Obama's Stimulus Plan Won't Work Either. Congress enacted the tax rebate program earlier this year because it perceived a growing risk of recession. In addition, it feared monetary policy alone would not be effective because of the dysfunctional credit markets. As American taxpayers know, most of the rebate checks have now been mailed and cashed. Those of us who supported this fiscal package reasoned that the program would boost consumer confidence as well as available cash. We hoped the combination would cause households to spend a substantial fraction of the rebate dollars, leading to more production and employment. My Comment: Those of us who did not support the plan knew it was doomed to fail. On April 19th in No Stimulus From Stimulus Checks I wrote "Here's the deal. Consumers are tapped out. Confidence is in the gutter. Much of the stimulus will be used to pay down debt. Most of the rest of it will be to buy necessities that people were going to buy anyway. That is the easily seen, or at least should be easily seen." On May 5th in Economic Stimulus Not a Silver Bullet I wrote ".... My conclusion is there is not going to be a noticeable surge in spending in the second half of this year. Those banking on stimulus checks to carry a second half recovery just might wish to reconsider." The evidence is now in and that optimism was unwarranted. Recent government statistics show that only between 10% and 20% of the rebate dollars were spent. The rebates added nearly $80 billion to the permanent national debt but less than $20 billion to consumer spending. This experience confirms earlier studies showing that one-time tax rebates are not a cost-effective way to increase economic activity. These conclusions are significant for evaluating the likely impact of Barack Obama's recent proposal to distribute $1,000 rebate checks to low and middle-income workers at an estimated cost of approximately $65 billion. His plan, to finance those rebates with an extra tax on oil companies, would reduce investment in refining and exploration, keeping oil prices higher than they would otherwise be. My Comment: Bingo. At least Feldstein now sees the light. Stimulus plans of this nature are economic nonsense. There is an interesting chart of the personal savings rate in Gas prices, falling home values stymied the stimulus plan. For the 2001 and 2003 rebate periods, personal saving rose sharply, but fell quickly thereafter. Real consumption grew in both periods, which contributed to economic growth. 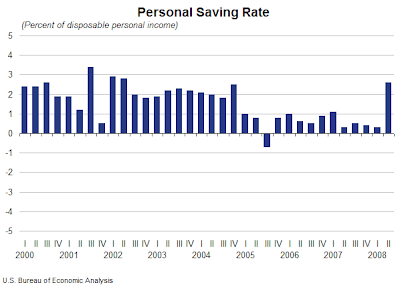 For the 2008 rebate period, personal saving rose sharply, and as in the previous periods, fell quickly thereafter. However, real consumption continued its previous downward trend. Most estimates expected consumers to spend at least 40% of the rebate checks, but in the end, they only spend 10%-20%. This has had negligible effects, if any, on economic growth. The savings rate bounced. Was that bounce totally induced by stimulus checks? The answer is no. Boomers heading into retirement counting on their home as retirement income are now stuck. They have no choice but to cut expenditures. Many caught in a death trap of credit card debt will default. Others are walking away from homes. For still others, bankruptcy will wipe the debt slate clean. Think those groups will all quickly get into trouble again? If so, think again. The Future Is Frugality. The consumption binge in the US is over. Peak Credit has been reached. A secular shift in mood from consumption to savings is now underway. That mood shift is unstoppable. The US was once a nation of savers. It is going to happen again.